The Lambda expression is one of the most important features of Java 8 which has opened a whole new dimension of programming paradigm in Java. It is the feature which made the Functional Programming possible in Java because now you can pass the code to a function to execute as opposed to an object. You might be a bit surprised but if you look from a developer's point of view, it is nothing but a way to pass code to a method in Java. Technically, it's an expression where you can define parameters and then the code which uses those parameters, similar to a method in Java, but you don't need to write boilerplate code e.g. method name, return type, argument type etc. Most of those details are inferred by compiler and JVM from the context in which lambda expression is used. Some of you might have questions like why lambda expression was introduced in the first place? Is it just the replacement of Anonymous class? Well, the lambda expression is more than that because it also introduces functional programming in Java. Now, Java has the best of both world i.e. Object-oriented programming and Functional programming which means you can write even more scalable and robust, mission-critical application in Java. Those articles contain very good notes about corresponding Java concepts and you refer to them to refresh your knowledge. Btw, if you are new to Java and just starting to learn Java Programming from JDK 8 onwards, I suggest you to first take a look at a comprehensive Java Course like The Complete Java MasterClass on Udemy. It's one of the best and also most up-to-date, recently updated for the latest Java version. Today I'll share 10 useful points about lambda expressions in Java 8. These points will give you a basic idea of lambda expression and encourage you to learn more about it. These are also a good refresher for Java Interviews and Java 8 certifications. It's kind of my personal notes about the lambda expression feature of Java 8. 1) The very first point about lambda expression is that you can pass a lambda expression to a method which accepts a functional interface i.e. a method which is either annotated by @Functional annotation e.g. interfaces from java.util.function package, or an interface with single abstract method e.g. Comparable, Comparator, Runnable, Callable, ActionListener etc. 2) The lambda expression allows you to pass a custom code to your Java method, which was not possible earlier. The only option you had was to work around your way by wrapping the code as an object and passing it to a method using anonymous classes. Also known as the Strategy design pattern in Java. is a method which accepts two integers arguments a and b and returns the sum of them. The return keyword is not required if lambda expression is a one-liner. 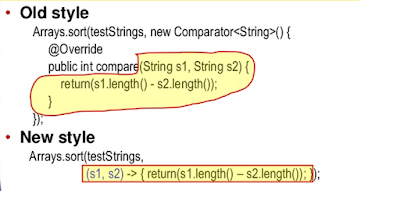 you can view this as a function which accepts two String arguments and returns int by comparing their length like positive if the length of first String is greater than second String, negative if first String's length is less than second String, and zero if both String has equal length. You can further see From Collections to Streams in Java 8 Using Lambda Expressions course on Pluralsight to learn more about how to use a lambda expression in your day to day coding. Though in this case, the return keyword is mandatory, you cannot omit it like a single line of lambda code. One more example is the addListener() method which acceptions an EventListener, you can pass a lambda to it because ActionListener just has one abstract method, actionPerformed(). If you want to learn more about where you can use a lambda expression, I suggest you take the course like What's New in Java 8 on Pluralsight you will not only learn about lambdas but other useful features of Java 8 as well. Btw, you would need Pluralsight membership to access this course which cost around $29 per month or $299 per year, which may seem big expensive at first but its completely worth of your money. You will get access to more than 5000 online courses on latest technology which will help you to learn anything you want. I had bought Pluralsight membership on just $199 on one of their flash sales and strongly encourage all programmers to have that kind of membership, it helps you to keep up-to-date. Anyway, even if you don't have Pluralsight membership you can still access this course by taking their 10-day FREE Pass which allows 200 minutes of free access to all their courses. That is enough time to access this course. 8) You can also pass a lambda expression to methods which accept a Functional interface, introduced in Java 8. These are interface annotated with @Functional annotation and contains just one abstract method. Java 8 API comes with several in-built functional interfaces in package java.util.function like Predicate, Consumer etc. 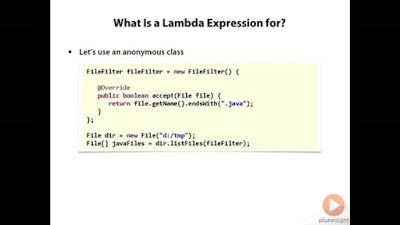 9) Lambda expression is an alternative of anonymous class in Java and should be able to replace all its uses where Anonymous class implements interface or extend a class with just one abstract method. 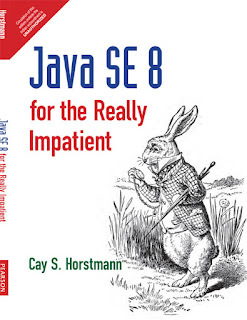 See Java SE 8 for Really Impatient to learn more about how to replace Anonymous class with lambda expression in Java 8. 10) You can use a static, non-static, and local variable inside lambda expression, this is called capturing variables inside the lambda. By the way, only final or effectively final local variables are allowed inside lambda expressions. 12)You can serialize a lambda expression if its target type and its captured arguments are serializable. However, like inner classes, the serialization of lambda expressions is strongly discouraged. You can read more about it on Java 8 in Action, one of the best books to learn Java 8. That's all about some of the important points about lambda expression in Java 8. It is one of the must-know concepts for Java developer because it has totally changed the way you code in Java. Several tried and tested idioms are now rewritten using lambda expression and stream to take advantage of lazy evaluation feature of the stream and reduced boiler code of lambda expression. If you haven't yet started with Java 8 yet, then now is the time to learn Java 8 because very soon every company will start hiring Java Developers with good command in Java 8. P.S.- If you just want to learn more about new features in Java 8 then you can also see this list of Free Java 8 Courses on FreeCodeCamp. It explains all the important features of Java 8 like lambda expressions, streams, functional interfaces, Optional, new Date Time API and other miscellaneous changes.